Rigoberto Uran gets the solo win. 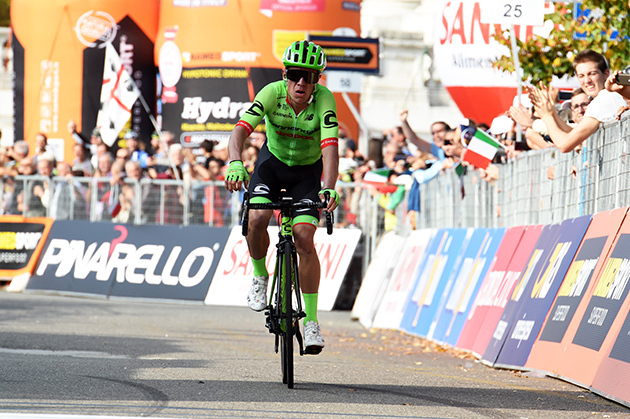 With a late attack, Rigoberto Uran finished solo in front of Superga, preceding Adam Yates and Fabio Aru. 6 POELS Wout SKY s.t. 14 CHEREL Mikael AG2R-LA MONDIALE s.t. 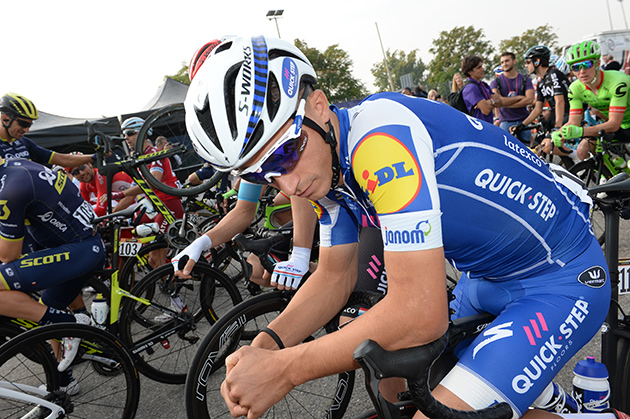 26 MOLARD Rudy FDJ s.t. 29 CANOLA Marco NIPPO-VINI FANTINI s.t. 30 KOSHEVOY Ilia WILIER TRIESTINA-SELLE ITALIA s.t. 32 TORRES Rodolfo ANDRONI-SIDERMEC s.t. 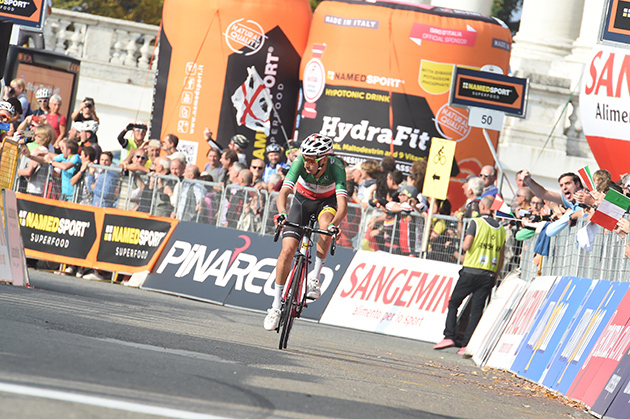 33 LAENGEN Vegard Stake UAE TEAM EMIRATES s.t. 41 ZARDINI Edoardo BARDIANI-CSF s.t. 49 MORI Manuele UAE TEAM EMIRATES s.t. 50 GRIVKO Andrey ASTANA s.t. 54 FLOREZ Miguel Eduardo WILIER TRIESTINA-SELLE ITALIA s.t. 55 BOUWMAN Koen LOTTO NL-JUMBO s.t. 60 CATALDO Dario ASTANA s.t. 61 FUGLSANG Jakob ASTANA s.t. 62 SANCHEZ Luis León ASTANA s.t. 64 SPREAFICO Matteo ANDRONI-SIDERMEC s.t. 65 BATTAGLIN Enrico LOTTO NL-JUMBO s.t. 66 ROGLIC Primoz LOTTO NL-JUMBO s.t. 67 MASNADA Fausto ANDRONI-SIDERMEC s.t. 68 CICCONE Giulio BARDIANI-CSF s.t. 69 GILBERT Philippe QUICK-STEP FLOORS s.t. 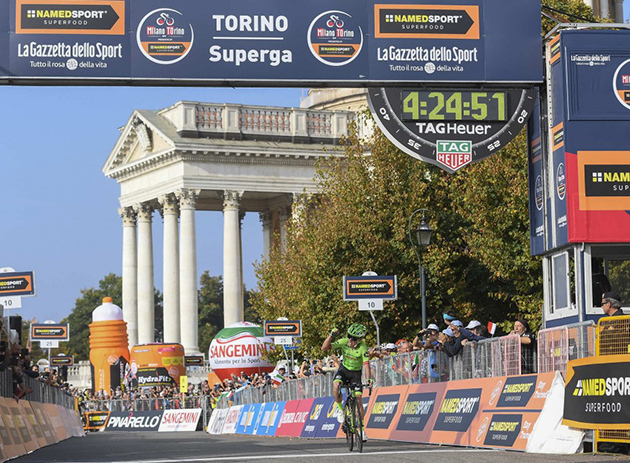 70 ORSINI Umberto BARDIANI-CSF s.t. 71 PETERS Nans AG2R LA MONDIALE s.t. 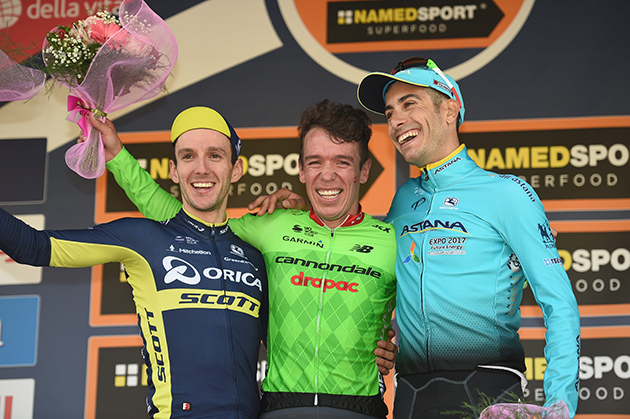 72 CUNEGO Damiano NIPPO-VINI FANTINI s.t. 73 OLIVIER Daan LOTTO NL-JUMBO s.t. 74 ATAPUMA Jhon UAE TEAM EMIRATES s.t. 75 HENAO Sergio Luis SKY s.t. 76 LAMMERTINK Maurits KATUSHA-ALPECIN s.t. 78 BIDARD François AG2R LA MONDIALE s.t. 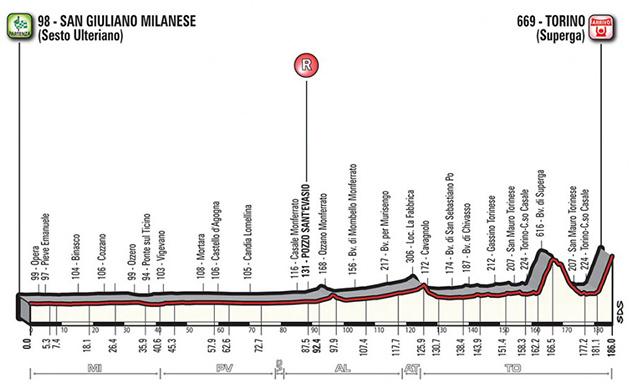 85 GANNA Filippo UAE TEAM EMIRATES s.t. 86 CONSONNI Simone UAE TEAM EMIRATES s.t. 87 REIJNEN Kiel TREK-SEGAFREDO s.t. 88 KOBAYASHI Marino NIPPO-VINI FANTINI s.t. 89 LADAGNOUS Matthieu FDJ s.t. 90 SIMON Julien COFIDIS s.t. 91 PLAZA Ruben ORICA-SCOTT s.t. 92 JUUL JENSEN Christopher ORICA-SCOTT s.t. 93 LAUK Karl Patrick ASTANA s.t. 94 TURRIN Alex WILIER TRIESTINA-SELLE ITALIA s.t. 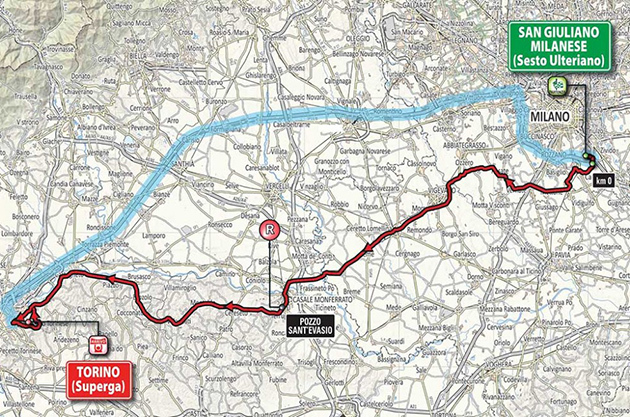 95 HOFSTEDE Lennard TEAM SUNWEB s.t. 99 VICIOSO ARCOS Angel KATUSHA-ALPECIN s.t. 100 BELKOV Maxim KATUSHA-ALPECIN s.t. 101 ROY Jérémy FDJ s.t. 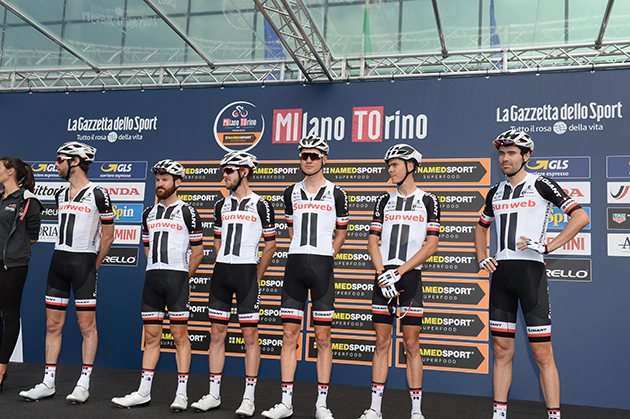 Team Sunweb is presented before the race start. 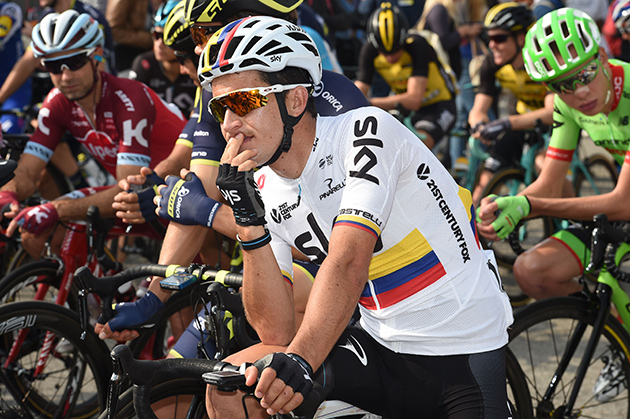 Sergio Henao waits for the start. He finished 75th. Rigoberto Uran took off with 3 kilometers to go and finished alone. 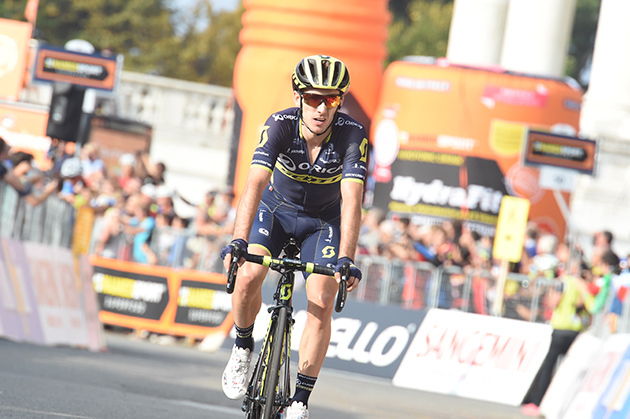 Adam Yates came in 10 seconds later. 28 TORRES AGUDELO Rodolfo A.